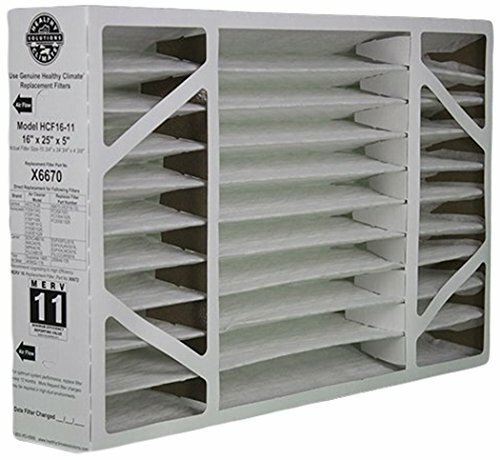 Lennox x6670 healthy climate hcf16 merv 10 replacement furnace filter - x6670. Filter dimensions: 16" x 25" x 5". actual size: 15.65" x 24.65" x 4.31". the Lennox x6670 merv 10 replacement filter fits the x6660 hcc16-28 air cleaner. This merv 10 x6670 filter from Lennox offers a 98% efficient filtration media capturing particles as small as 0.3 microns before they can collect on your coils. High-efficiency alternative to one-inch filters. It's larger media capacity allows for greater dust-holding ability. The Lennox x6670 merv 10 filter is a suitable replacement for the Lennox hcc16-28 air cleaner as well as many other Lennox, Honeywell and carrier air cleaners that accept a 16" x 25" x 5" filter media. The Lennox x6670 filter is designed to fit the following air cleaner models: Lennox: Hcc16-28, hcc16-28, hcxf16-16, hcf16-16, hcf16-10. Carrier: Ezxcab016, filcabcc0016, mpka0016, macpak, mpka, mac. Honeywell: F25a1043, f25f1042, f35f1008, f100f1012, f150e1026.